Sorry, I'm Dead played at the Deutschtown Music Festival on July 12th, 2018. 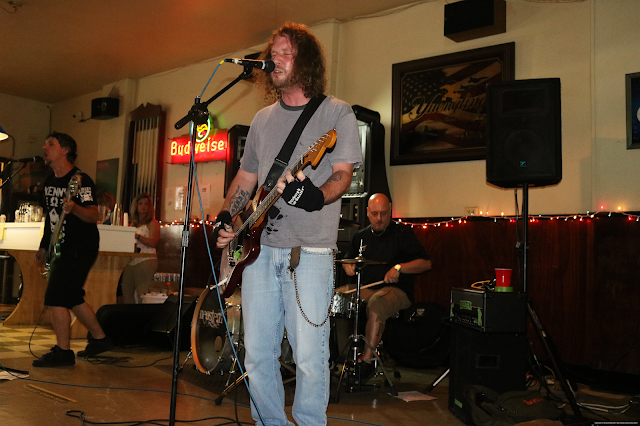 We ended up playing Friday at 5pm at the YMR Club, the first show with the new lineup. I was really excited heading down to the festival. I had never been there before, though I had always intended to go. As I have mentioned before, music festivals give me anxiety about missing them and being on time (not about crowds or public spaces), so I often do miss them. Having a deadline helps me stay focused. We stopped at the green room, and then went down the street to the YMR Club. It was much smaller than I expected, but there was already a decent crowd. The audience didn't seem pleased to see us; I felt like we were invading somebody's semi-private space. Once we started playing, the people seemed to be into it. We started with an instrumental jam, and then went into an array of classic songs such as "Stand Me Up Tonight", "Killed in an EC Comic", and "Neon". People were dancing and really listening to the musick. There were a few errors on our part, a sense of unsureness within us as a unit. I can't necessarily speak for others, but I can say that we were surely not yet cohesive. It wasn't bad regardless. At the end, members of the audience said how great it was. They really liked us; I don't think they were disingenuous. We decided to stay for the next band at least. Neostem was next. Basically a grunge band, Neostem was focused in their heavy music. It was pretty cool; I didn't expect to like them as much as I did. The entire scene, the band and the venue, looked like a background stage in King of Fighters. It was refreshing to see a band that was so into what they were doing, and I hope to see them again sometime. We stopped back at the green room. There was a bunch of good-looking food, but I could eat none of it. It was disappointing but not surprising. We talked with a few of the other bands and a man who used to come up with songs for bands in the 90s, specifically Soundgarden. I think he just came up with ideas for songs and some small parts, not necessarily the whole composition. I was pretty tired and there was a lot going on to pay attention super closely. Regardless, I was interested in his wild stories of rock 'n' roll myth. After that we walked around for a bit, grabbed t-shirts that listed all of the bands and had a cool Joe Mruk illustration, talked with the new Pittsburgh Current, and then drove back to Lawrenceville. Let's do it again next year!